Running Y Resort sits just across the California border, surrounded by the beauty of the Cascade Mountains. The challenging golf course was designed by Arnold Palmer and has been ranked as one of the top 100 public courses in the country as well as one of Oregon's best. When asked to pick some of his favorite designs, Running Y made the list. The golf course takes advantage of all the beauty of southern Oregon, preserving the landscape with such care that is was certified as an Audubon Cooperative Sanctuary. The layout features Palmer's signature fairways that are both curvy and receptive. 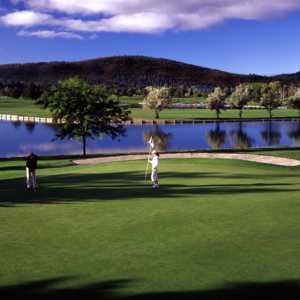 The front nine wraps around Klamath Lakes and plays through dense woodlands while the back nine crisscrosses through Payne Canyon. The final holes are also laced with Scottish-style mounding and a few water hazards. Dress code: Traditional and appropriate golf attire only (Men must wear shirts with collars or mock tees. Women may not wear halter-tops or bathing suit attire) (Women may not wear halter-tops or bathing suit attire). Spectacular vistas and a great, fun Arnold Palmer Course. I found it addictive and play it regularly when traveling to Southern Oregon. It is generous off the tee but putting is very challenging. My wife, a 12 handicap, enjoys a choice of 3 women's tee boxes. This is a beautiful, well designed, challenging golf course. When traveling up to Bend don't miss The Running Y. I need to get back down to play it again.